A clear understanding of the calculations and predictions involved in low-energy building relies upon the use of accurate modelling software. 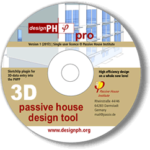 Based on dynamic thermal simulations validated by data gathered from hundreds of low-energy buildings, the German Passive House Planning Package (PHPP) is the software we use to calculate energy use and CO₂ emissions. PHPP’s level of sophistication enables it to take into account a wide range of variable characteristics which affect heat loss and subsequent energy use, allowing for a superior fit between predicted energy use and real-world performance. Suitable for both residential and many non-residential applications, PHPP is supported by an AECB training course to help you get the most from this software. New customers are advised to go to the pre-sales FAQs at http://www.designph.org/FAQ and also http://www.designph.org/prices – where most of the issues regarding version differences and compatibility with SketchUp and PHPP versions are clarified. PHribbon works with PHPP v9.6, working directly on your PHPP. 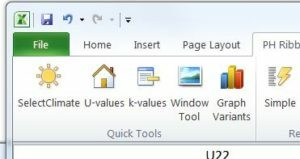 It has tools for entering climate regions and site data, k values, entire U value assemblies and windows and also graphs variants together so you can compare. For those interested in retrofit, there is also a version including 3 costing tools (REALcosting).